My Mother in Law is on a low sodium diet (under 1000mg per day). Faced with the challenge of her diabetes plus her sodium restrictions, she could not buy commercially made breads. 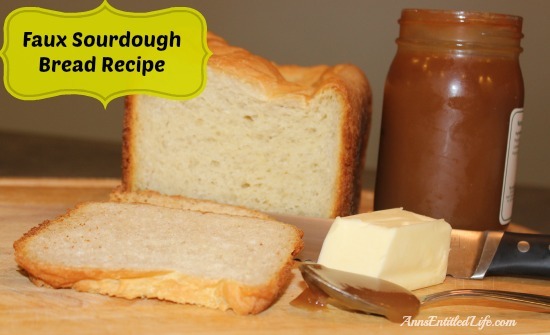 Hubby gave her caregivers this recipe years ago, and she has been making, and enjoying, this Faux Sourdough Bread Recipe ever since. • All ingredients should be at room temperature before beginning. • Combine ingredients in order in your bread pan. • Bake according to your bread machine’s instructions (white bread is the bread choice). • To print the Faux Sourdough Bread recipe click here. This low sodium, low glycemic faux sourdough bread has been a staple of my diabetic mother-in-law’s diet for many years now. As an added bonus, she is also low sodium. When she was first diagnosed, low sodium/low sugar breads were nearly impossible to find. There is one frozen variety she said didn’t taste good. There is also a variety now (2015) that Trader Joe’s sells fresh in east coast stores. Unfortunately, my mother-in-law live out west (Las Vegas), and can’t get that bread. Sooooo, her caregivers continue to make this recipe for her weekly. Note: her aids do say it freezes well when they have extras! • We use the WEST BEND Bread Slicing Guide which stores very compact, and really does work! My hubby loves sourdough and I do bake-but keeping a sourdough mother is like keeping a pet (And I don’t need another pet). My question is about the sodium. For flavor purposes, I usually cut the qty in half in recipes but rarely omit it entirely. What happens if I add a pinch or two in this case? Will it adversely affect the chemistry? I do not know, Barbee, but I doubt it will hurt. The lack of sodium makes the bread flatter, so you may get a better looking bread with a pinch. And yeah, this is awesome to not have or keep, a starter. Kathy, I just asked my husband (it is his mom that the aids make it for), and he said they never make it without the bread machine, and can’t recommend an oven temp, bake time, etc. 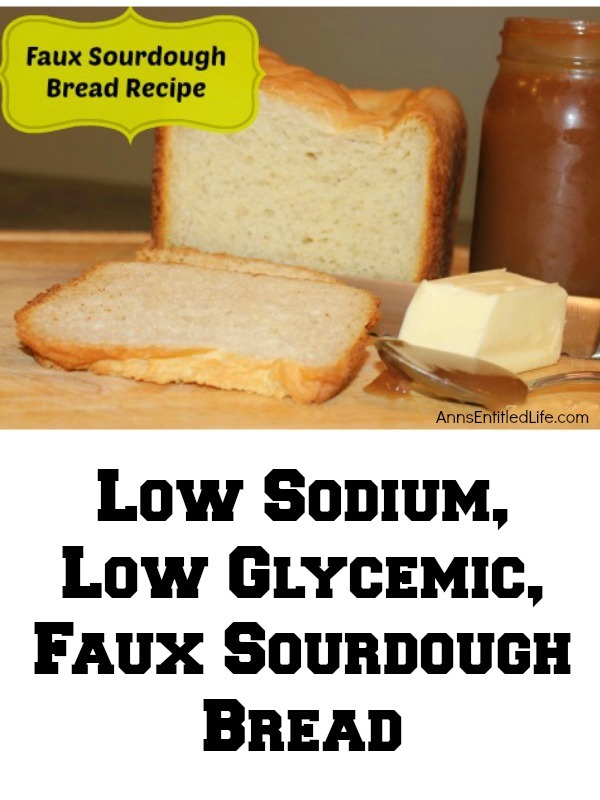 It looks like a white bread which is not good for diabetics, is there a certain brand of flour, white bread flours are high in carbs, What makes this recipe Low Glycemic. The vinegar may help out in regulating blood sugar as well as the fact that is a sourdough bread. Can you let me what you think it has for the amount in Carb and Sodium? Klista, Atkins has a carb counter app you may want to try: carb counter. I will say that Hubby is currently doing Keto and has NOT made this bread for himself (not sure if that means the carbs are a problem, or if he is simply lazy).